This was a fun reminder that time synchronization, like reverse DNS lookup, is critical to infrastructure. tl;dr, verify ESXi host time synchronization before deploying PSC and VCSA. 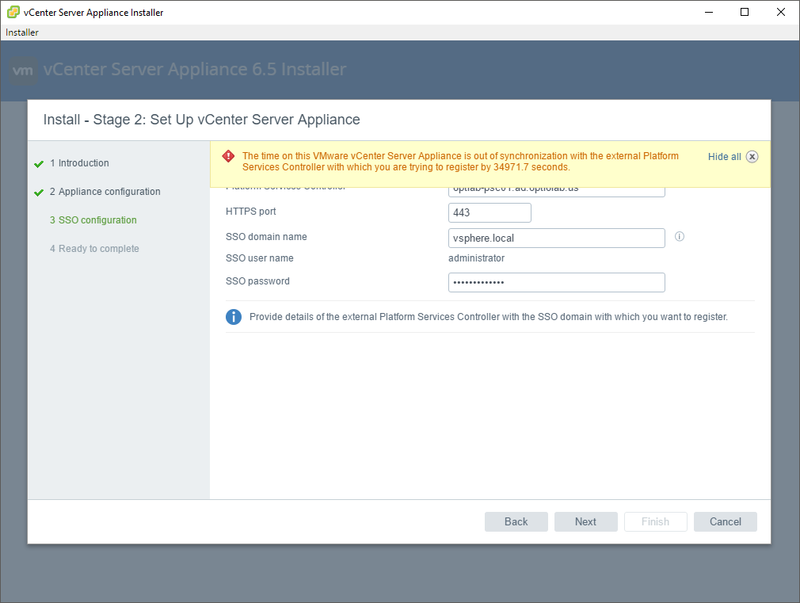 While deploying the new vCenter Server 6.5 for our “production” demo lab, I ran into issues during Stage 2 of the vCenter Server Appliance (VCSA) installation with an external Platform Services Controller (PSC). The time on this VMware vCenter Server Appliance is out of synchronization with the external Platform Services Controller with which you are trying to register by 34971.7 seconds. My initial thought was to jump into the VCSA via SSH to begin troubleshooting the issue. After gaining shell access, I immediately launched a date command to view the system time. Ah ha! That is not the correct time, or time zone! Connecting to the PSC via SSH, gaining shell access, and launching the same date command gives me a very different time–one that matches my workstation. Let’s look into the Appliance Management interface of the PSC (https://hostname.domainname:5840). After reviewing logs and testing deployments of PSC and VCSA using varying settings, NTP servers, and firewall policies I am confident I found the cause of the initial time mismatch: time settings of the host server. PSC deployed, immediately receives time settings from host. Stage 2 of installation wizard for PSC sets up NTP time synchronization. VCSA deployed, immediately receives time settings from host. By this time, the PSC has synchronized its time with that of the NTP servers. Stage 2 of the installation wizard for the VCSA fails when connecting to the PSC because of time mismatch. I followed the successful deployment with several more, independent PSC+VCSA installations to verify that everything works as expected when the ESXi host has correct time settings.